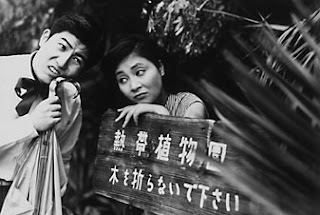 Nishi Ginza Station (1958) was Imamura’s second film, a studio assignment made as a vehicle for popular singer Frank Nagai. Imamura was able to use this as a vehicle for himself as well, indulging in a playful formalism that breaks the narrative in a number of ways. Nagai appears right at the beginning, addressing the camera. “What an interesting place!” he says of the train station where much of the film takes place. He will tell us “a good story” about the married couple we will follow for the rest of the film. “But first,” Nagai says, “Let’s listen to my song … Hey! Music!” He pops up throughout the film to comment on the action, a device that amusingly anticipates Jonathan Richman’s musical interludes in the Farrelly Brothers’ There’s Something About Mary, among other films. After the credits sequence, which appears in neon lights, various people in the station break out into song, prompted by Nagai’s jazzy start. We are then introduced to a woman complaining about the inaccurate station clock. Her kids knock over the ladder of the man working on it, and trailing after is her meek, henpecked husband. These two form the central couple of the film. Jutaro is a Walter Mitty-esque character who daydreams about romancing a native woman on a deserted island. This foreshadows Imamura’s later portraits of primitive societies such as Profound Desire of the Gods (1968) and The Ballad of Narayama (1983). Jutaro works in his wife Rinko’s pharmacy, and his life is regulated down to the minute. He has to take regular doses of a “body energizer,” and he is monitored on this by his wife’s employees. When his wife and kids go away on a two-day trip, Jutaro takes this opportunity (egged on by his veterinarian friend) to taste a bit of freedom. They go to bars and get drunk, and Jutaro finds the courage to attempt an extramarital affair with Yuriko, who works in the pen shop across from the pharmacy. The film alternates between Jutaro’s fantasies and his real life, with Nagai as a commentator or a silent observer (or in a couple of cases as the man in the moon, and a cave wall carving). Compared to the films he would make later, Nishi Ginza Station is a minor work. However, many of the elements that would come to the fore later, such as his bawdy humor and his experiments with form, can be seen here in embryo.